Can the flashy branding built on Maryland's connection to Under Armour draw in elite recruits? That's what the Terrapins are hoping happens. COLLEGE PARK, Md.—Most of the top quarterbacks in the 2016 recruiting class made up their minds about which colleges they plan to attend before the end of spring football. By May 1, nine of the class’s top 10 signal-callers, according to Rivals.com, had issued verbal commitments. 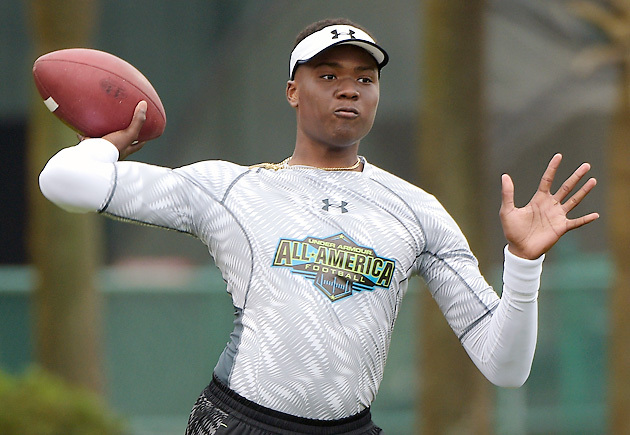 Maryland viewed the lone outlier, Dwayne Haskins Jr., as one of its recruiting priorities. A star at the Bullis School in Potomac, Md., Haskins threw for more than 1,900 yards with 22 touchdowns and five interceptions and was named Maryland’s Gatorade Player of the Year as a junior. His arm strength, accuracy and ability to keep plays alive drew upwards of 30 scholarship offers, including from Florida State, Notre Dame and Ohio State. Terrapins fans hoped Haskins would spurn overtures from several more high-profile programs in favor of a picking nearby school that hasn’t won more than seven games since the 2010 season. On May 15, after narrowing his list to six schools (Florida, Maryland, Notre Dame, Penn State, Rutgers and Virginia Tech), Haskins announced that he had verbally committed to Maryland. ​Haskins’s pledge was considered a massive victory for the Terps’ local recruiting efforts. In the bigger picture, it inspired optimism that better quarterback play could elevate a program that has endured inconsistency at the position in recent years. In an interview about three weeks after committing, while discussing Maryland’s recruiting pitch, Haskins explained that—at least in one respect—some prospects think the school resembles Oregon. “Just what Oregon, the person that founded Nike (Phil Knight) went to Oregon and he definitely supports them with new jerseys and new apparel. So, same thing with Kevin Plank. He does a lot [with] Under Armour for Maryland,” Haskins said. The comparison may seem far-fetched, particularly in the win-loss column, but the similarities between the two programs can’t be ignored when assessing Maryland’s attempts to attract top prospects to College Park. Can the Terps model themselves as the Oregon of the East in a push to further their recruiting efforts? The Terrapins have long struggled to keep the most coveted high school players in Maryland and Washington D.C. from leaving the area. Over the course of the last 15 years, top local prospects from Eleanor Roosevelt High’s Derrick Harvey in 2004 (Florida) to DeMatha Catholic High’s Cyrus Kouandjio in ’11 (Alabama) have rebuffed the Terrapins to attend schools in different parts of the country. Maryland has landed its share of nearby blue-chip talent, including five-star receiver Stefon Diggs in ’12 and four-star defensive tackle Adam McLean in ’14. On the whole, however, the DMV (D.C., Maryland and Virginia) has been a poaching ground for Power Five juggernauts. Between ’11 and ’15, Maryland landed only seven of the 50 top 10-ranked recruits in Maryland and seven of the 25 top five-ranked recruits in D.C., according to Rivals.com. The good news for Maryland? There are reasons to believe those numbers could change for the better, starting with the school’s recent conference realignment. The announcement that Maryland was moving to the Big Ten in November 2012 was greeted with eye rolls both by Terrapins supporters chagrined over the pending disintegration of ACC rivalries and by other college sports fans who viewed it as a naked money grab. But it’s hard to argue the move didn’t bump Maryland’s Q rating in the national football landscape. Not only are the Terrapins set to earn more media rights revenue in the Big Ten than they would have in the ACC, but their schedule will also feature more high-profile opponents, a huge selling point for recruits. In addition, the move broadens Maryland’s recruiting base, as the Terrapins can sell prospects from the Midwest on the idea of playing road games at venues like Ohio Stadium and the Big House. In the Big Ten’s East Division, Michigan State and Ohio State largely focus their recruiting efforts in the Midwest. However, Maryland and Penn State have already formed a pseudo-rivalry that should offer plenty of intrigue as the two programs battle for top talent along the eastern seaboard. Look no further than 2014. Nittany Lions coach James Franklin, a former Maryland assistant, said in May that he considers Maryland and Washington D.C. “in-state” recruiting areas for Penn State. A few months later the Nittany Lions lost a target to the Terrapins when McLean, a Quince Orchard (Md.) High standout, flipped to Maryland after previously shaving the words “Penn State” into his fade. Any prospect who visits Maryland’s campus should get a clear indication of the pride Edsall takes in beating Penn State; a framed newspaper story covering the Terps’ 20-19 win in State College last November hangs on a wall in his office. Another key component of Maryland’s recruiting pitch is the school’s tie-in with Under Armour. The Baltimore-based apparel company, which was founded by former Terrapins football player Plank, has outfitted Maryland with an array of flashy uniforms. The program debuted its “Maryland Pride” threads bearing state-flag imagery for Edsall’s first game as head coach in 2011 and has since donned a collection of variously styled red, yellow, white and black designs. To the casual observer, game-day style may be dismissed as trivial. Yet for Maryland, a school without a longstanding tradition of success, gaudy kits have not only helped grab recruits’ attention, but have also enhanced its national profile. Uniforms and the company that provides them have undeniably become integrated into the Terps’ brand. No school’s athletic department more proudly trumpets its association with Under Armour than Maryland. Last September the two sides agreed to a 10-year contract extension worth roughly $33 million. The strong connection between school and company is not lost on Darrius Heyward-Bey, the former Maryland and current Pittsburgh Steelers receiver who began his college career before Under Armour became the school’s official apparel provider in 2008. He still happily promotes the brand. “We wear it proudly,” Heyward-Bey says. When will that puzzle become something more than a talking point? 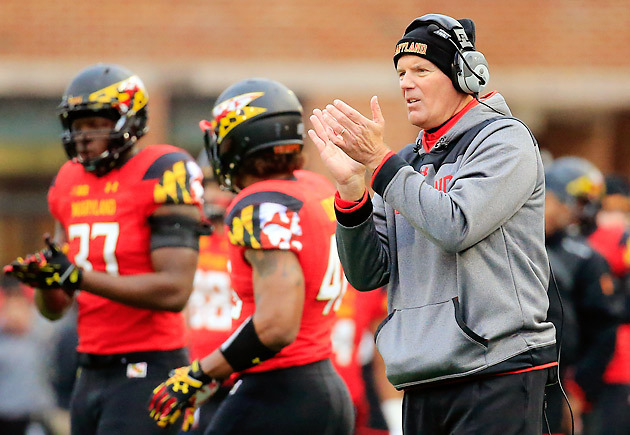 How well has Maryland recruited to this point in Edsall’s tenure? There have been mixed results. Since 2011, the first year Maryland signed a recruiting class after Edsall was hired away from UConn, the Terps have not cracked the top 30 of Rivals.com’s class rankings. However, that does not present a complete picture. Considering Maryland’s aim to hoard local talent, an important characteristic to track is how many of the school’s recruits hail from the surrounding area. While the official boundaries for the DMV remain unclear, for the purposes of this study two statistical areas defined by the Office of Management and Budget were used to sort Maryland’s recruits: the Washington-Arlington-Alexandria Metropolitan Statistical Area and the (larger) Washington-Baltimore-Arlington Combined Statistical Area. Between 2011 and ’15, Maryland landed an average of 7.8 recruits per year from the latter area. That number peaked in ’13, with 11 players, and Maryland’s class of ’16 currently counts 10 prospects from the area. Another trait to monitor is whether the Terrapins’ recruiting has changed since they realigned to join the Big Ten. Though Maryland didn’t play its first season in the conference until 2014, the move was announced more than a year earlier. Is Maryland now landing more recruits from the Midwest? And conversely, are more Big Ten programs poaching talent from the DMV? In an attempt to answer these questions, SI.com tracked the number of prospects Maryland reeled in between ’11 and ’16 from the Big Ten’s pre-1990 footprint (before Penn State joined the conference). In addition, as a proxy for recruiting competition, SI.com calculated the average number of offers each member of Maryland’s recruiting classes between ’11 and ’16 received from other Big Ten schools, as listed by Rivals.com. Even if the results so far are limited, it’s clear the Terrapins are, at minimum, trying to extend their reach into Big Ten country. Among the primary recruiting areas* assigned to Maryland assistant coaches this year are Michigan-Detroit, Illinois-Chicago, Indiana-Indianapolis and Ohio. In 2016 Maryland is strongly endorsing the idea of homegrown recruits banding together and joining the Terrapins. Haskins has embraced his unofficial role as the ringleader of Maryland’s recruiting push known as The Movement, and the Terps have promoted it on social media by using the #DMVtoUMD hashtag and by disseminating photoshops featuring the ESPN 30 for 30 logo. Haskins has good relationships with many of the top players in the area and read a list of 20 names at his announcement that he hopes he’ll convince to follow him to Maryland. The list, which he called a “dream list,” features many of the East Coast’s top recruits, including some who have already committed elsewhere. Haskins says he thinks he can persuade more than half of those players to join the class. In addition to Haskins, Maryland has already has landed verbal commitments from local standouts Keandre Jones, a four-star linebacker who attends the Academy of Our Lady of Good Counsel High; Darryl Turner, a four-star athlete who attends DeMatha Catholic High; and running back Lorenzo Harrison, defensive back Travon Stott and offensive lineman Terek Zingale, all three-star prospects. Other recruits Haskins and Maryland hope to convince to join The Movement include four-star linebacker Keith Simms, four-star offensive lineman Terrance Davis, and four-star wide receivers Tino Ellis and Trevon Diggs, the latter of whom is set to make his college decision on July 4. Of course, the Terrapins won’t be nearly as attractive to those prospects and others both in the DMV and from other locales unless they begin to improve their product on the field. The notion of Maryland impressing recruits with its Oregon of the East appeal is seductive for Terrapins fans, but the momentum could dissipate quickly if Maryland flops in its second year in the Big Ten. “The key component to that is you also have to win,” says Mike Farrell, the national recruiting director for Rivals.com, adding that “some of these Maryland kids will wait to see how this season goes as well. Or if they do commit, and the season doesn’t go well, then things could change.” The Terps went 7-6 and 4-4 in league play in 2014. That’s a question Edsall and others at Maryland hope more recruits will ask. *Assistant coaches are assigned primary, secondary and local recruiting areas.